We've made it simpler than ever to design, order, and install you own dream kitchen. UDUIT is New Zealand's original online DIY Flatpack Kitset Kitchen system. Your online link direct to the manufacturer means you can access superb quality, great choice of 35 colours, and huge savings. Click on this link to see a brief introductory video. Precision manufactured and dispatched 7 working days after your order is confirmed, delivery is to your doorstep - it's that simple. Cabinets, hardware doors, & panels come neatly packed, along with comprehensive assembly instructions. 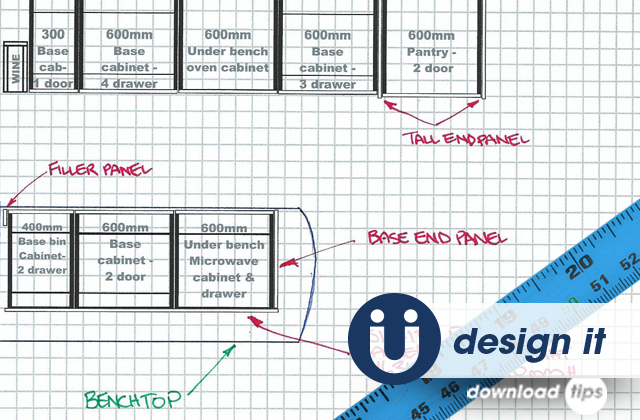 Working out your design is simple with our U-Size-It feature - where you can alter the cabinet widths to suit your design. Our customers love this. It's all at your fingertips on our easy to use quoting and ordering system. Enquire about an appointment to visit the showroom or take the virtual showroom tour. If you have questions about specifications, check out our FAQ page. Why 100% online? It means there is absolutely no one between you and the your Manufacturer. No middlemen, no large sales team or expensive overheads. All orders are placed by you via the online ordering system (obligation-free quoting is easy too). Any inquiries are answered by email. Why? It means we can give you the best possible price, and our team can concentrate on making and delivering your order quickly. 100% New Zealand manufactured and 100% New Zealand owned. The New Zealand made board used in our cabinetry is the world's best for interior furniture. New Zealand leads the world in high quality low emission board sourced only from New Zealand's sustainable Radiata Pine plantations. Hardware is supplied from trusted reliable suppliers who comprehensively test their products and stand behind them. You can be sure you are getting the best materials and top quality construction. Our company has been operating in the kitchen market since 1976. Uduit was launched as a concept in 2000. Working with new sophisticated and advanced precision technology, Uduit has introduced another first, U-Size-It. All at your fingertips on the quoting and ordering system, you now have the flexibility to select cabinet sizes on key cabinets to match your design (not the other way around!) Our customers love this. Also - if you have a cabinet that is not shown in the range that you need to complete your design...just ask us! Your cabinets will be manufactured and dispatched 7 working days after receiving payment for your order! The system in behind the website and the precision high speed technology enables this fast lead time - year round. UDUIT delivers to your doors step. This saves you a lot of time and hassle! What you need to do is prepare a handy ground floor location to receive the delivery - like a garage. Also at least 1 person needs to be there to assist the driver with unloading as each pack is at least a 2 person lift and there is only 1 driver. There is no compromise with quality. We use the best materials, specifications, and manufacturing. Everything is made to order. Moisture Resistant Board is used exclusively on both cabinets and doors. In any kitchen moisture spills need to be wiped up immediately, however MR board provides longer resistance to moisture absorption compared to standard board. Soft close hinges are included on all kitchens for standard straight/opening doors, and you also have the option of standard Funktion drawers or upgrading them to soft close action as well. Of course all of this is backed by our warranty on manufacturing and materials for 5 years. We began manufacturing in 1976 and have been operating under the same owner since that date. UDUIT was launched in 2000. We know from experience it's important to produce a quality product, and to stand behind it. If there is something not made up to standard, just let us know, we will sort it out quickly.